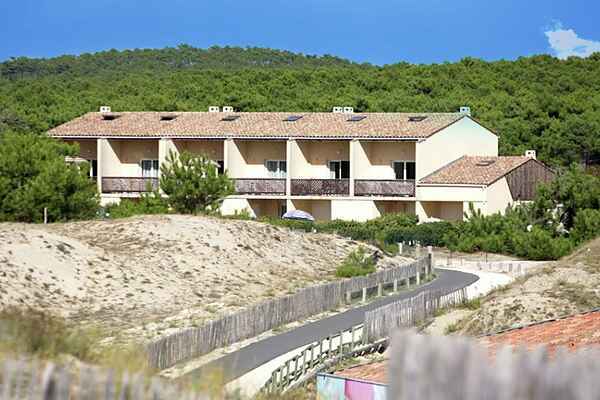 Simple apartments, directly on the vast sandy beach of the lively seaside resort of Hourtin, perfect for those who love sun, sea and surfing. You will find many, mostly young, surfers here, floating about the sea, waiting for the next good wave! The residence is situated at the edge of the dunes and the village. The town centre, which has a few bars, restaurants and shops, is around the corner. There is a cycling path that leads to Hourtin Lake. A day trip to Bordeaux (roughly 60 km) is also worthwhile. You have your choice of 3 different types of holiday homes. FR-33121-04 (T2) is suitable for 2-4 guests. This is a ground-floor apartment that features a double bedroom and a little 'beach garden'. FR-33121-08 (T3) is suitable for 4-6 guests. This is a first-floor duplex apartment. It features an additional bedroom with two single beds below the low, sloping roof. Balcony. FR-33121-06 (T4) is suitable for 6.8 guests; it is identical to type T3, but boasts an additional bedroom with two single beds in the attic. All types feature a basic kitchenette and a double sofa bed in the living room.